By this term is understood the program of Political Zionism drawn up at the first Basel Congress, as the aim of the political-Zionist movement. The Basel Program was unanimously accepted at the morning session of thesecond day of the first Congress, after a report by Max Nordau, chairman of the executive committee. It is as follows: "Zionism aims at establishing for the Jewish people a publicly and legally assured home in Palestine. 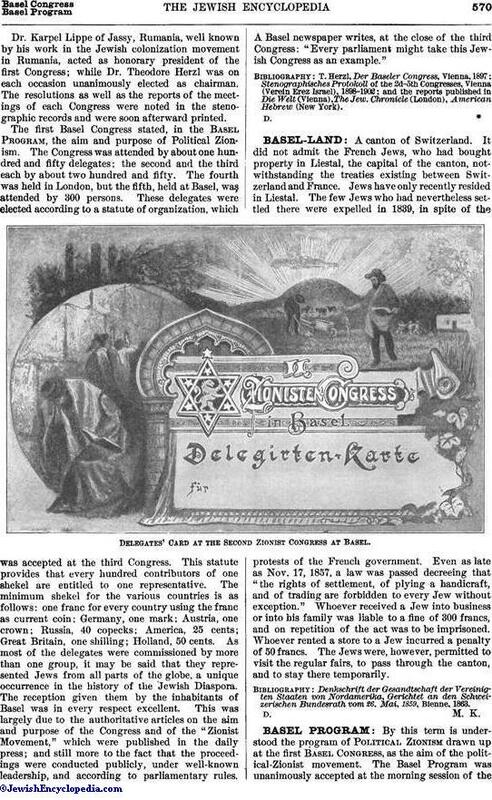 For the attainment of this purpose, the Congress considers the following means serviceable: (1) the promotion of the settlement of Jewish agriculturists, artisans, and tradesmen in Palestine; (2) the federation of all Jews into local or general groups, according to the laws of the various countries; (3) the strengthening of the Jewish feeling and consciousness; (4) preparatory steps for the attainment of those governmental grants which are necessary to the achievement of the Zionist purpose." In the course of the proceedings it was found necessary to explain, first, that the struggle for a publicly and legally assured home was meant to be only for those Jews who either could not or would not assimilate in their respective dwelling-places; secondly, that (political) Zionism did not intend to take any steps that would offend the religious sentiment of any Jew, whatever his opinions. The first statement was made for the reason that the opponents of the movement had used all conceivable means to prevent and to discredit the Congress and its aims. They had succeeded in frustrating the original intention to hold the Congress in Munich, and they made it a prominent argument that the assertions of the anti-Semites were confirmed by the holding of this Congress. They held that the entire idea was Utopian; that a transfer of all Jews to Palestine would be materially impossible if for no other reason than that Palestine could not hold them all. Furthermore, that in some countries Jews enjoy all political rights and privileges; that the emigration of these Jews would be therefore not only unnecessary, but highly ungrateful toward those countries in which they enjoy such rights, etc. Others thought they found in the Basel Program a menace directed against the independence of Turkey. It was, however, repeatedly emphasized in precise terms by the leaders of the movement that political Zionism had nothing in view which in any way resembled a territorial menace to the Ottoman empire. It hoped to achieve its goal by rendering service to Turkey; thus procuring a Turkish charter, in order that it might secure for the Jewish Agricultural Colonies in Palestine already existing, and to be established there, an autonomous government under the suzerainty of Turkey. The second statement was due to some fears expressed by the Basel rabbi Dr. Cohn. He voiced the sentiments of the Orthodox, and said "that the party, of which it is known that it does not subscribe to the opinions of Orthodoxy, might oppress the Orthodox." To this is due the declaration, made by the chairman of the Congress and reenforced on every occasion, that political Zionism aims exclusively at the improvement of the political condition of the Jews. It thinks that this improvement is to be found if those Jews who only possess political privileges in a limited measure or not at all, or who in any other way occupy an inferior position with respect to their fellow-citizens of other religions, are provided with better political, and thereby better social, conditions. The satisfaction of religious needs is left to the individual. 1. For the proper settlement of Palestine, this Congress considers it necessary to obtain the requisite permission from the Turkish government, and to carry out such settlement according to the plan, and under the direction of a committee, selected by this Congress. 2. This committee to be appointed to superintend and direct all matters of colonization; it shall consist of ten members, and have its seat in London. England shall send three delegates to this committee; Russia, two; Galicia, one; Germany, one;Rumania, one; and the executive committee shall appoint two. At least three of the members must reside in London. The executive committee will defray the necessary expenses of its administration. 3. The first action of this committee shall be taken in connection with the Jews now residing in Turkey. 4. The Colonial Bank shall cooperate in obtaining the desired permission for colonization from the Turkish government. 5. The Congress enjoins upon all Zionists the duty of influencing all colonization societies to work in harmony with the above plan. 6. The Congress requests the executive committee to undertake accurate investigations to ascertain the legal position of the Jews in Turkey, and particularly in Palestine. 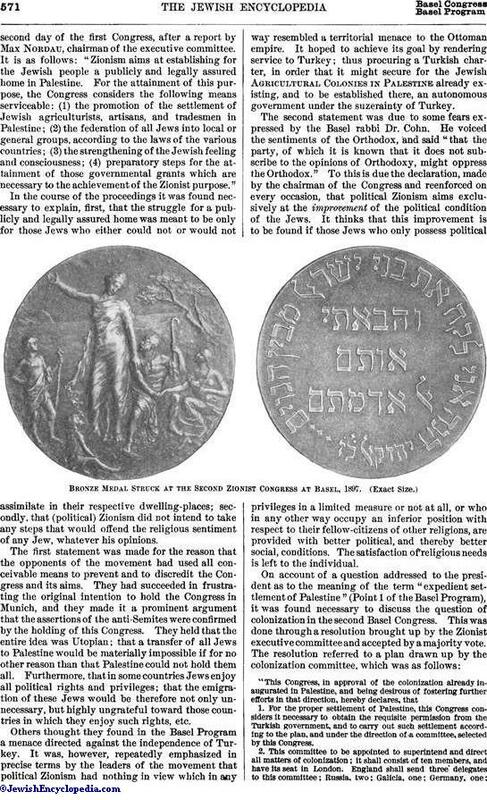 Another important resolution of the second Zionist Congress was the founding of the Jewish Colonial Trust, which is to be the financial instrument of political Zionism. 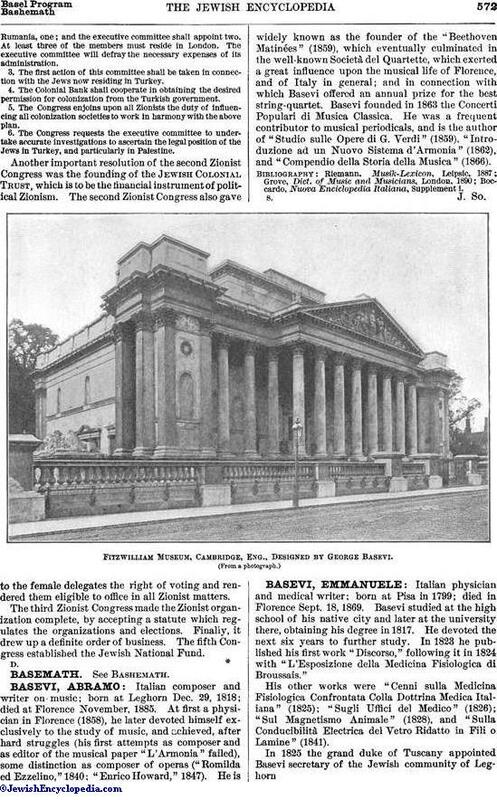 The second Zionist Congress also gave to the female delegates the right of voting and rendered them eligible to office in all Zionist matters. The third Zionist Congress made the Zionist organization complete, by accepting a statute which regulates the organizations and elections. Finally, it drew up a definite order of business. 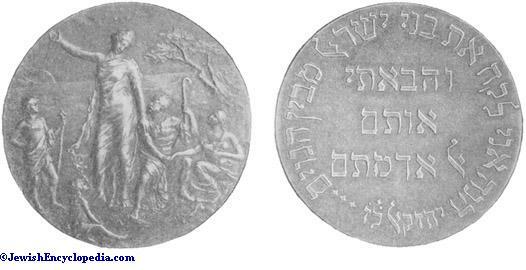 The fifth Congress established the Jewish National Fund.